TL;DR: Historic, doomed vaudeville-turned-movie house practically thrown away by the city government. 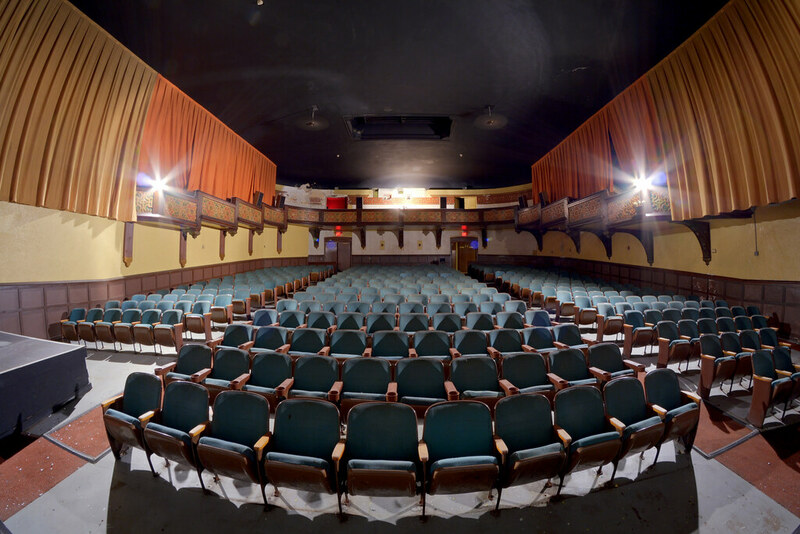 History: Situated in the heart of its later-namesake Illinois town, the originally-named Alcyon Theater began entertaining the suburbs of Chicago’s North Shore as a single-stage vaudeville house, complete with an orchestra pit and Barton organ, in 1925. 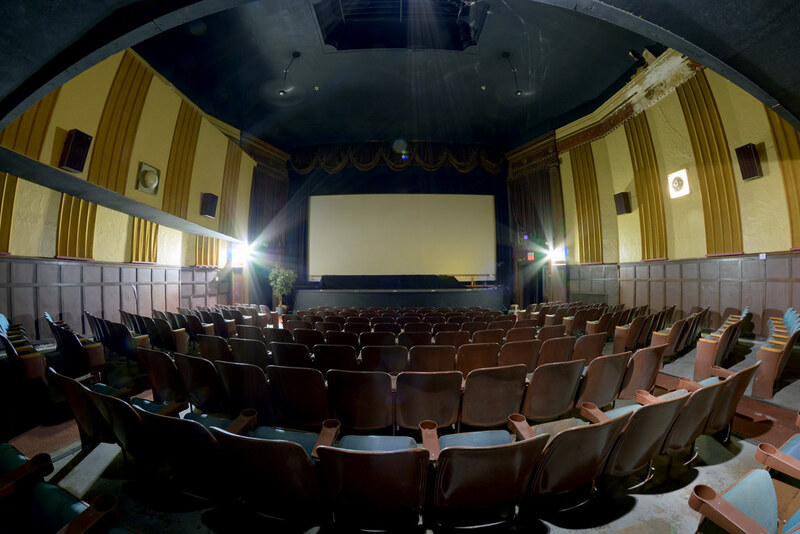 It was designed by William D. Mann in a Tudor-revival style that complimented the local architecture, and owned by William and Bertha Pearl – owners of the nearby Pearl Theater. 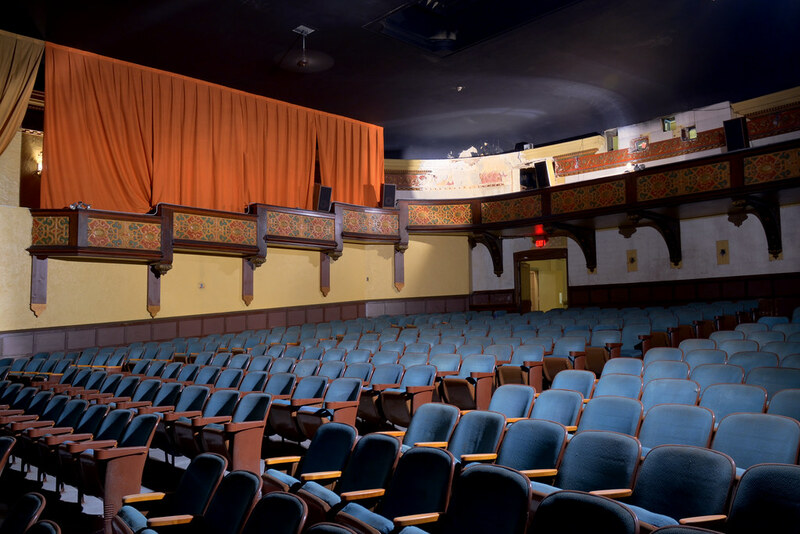 The 1,100-seat theater itself was unique in that it did not feature a a full balcony level, but rather a series of upper box seats surrounding the auditorium. 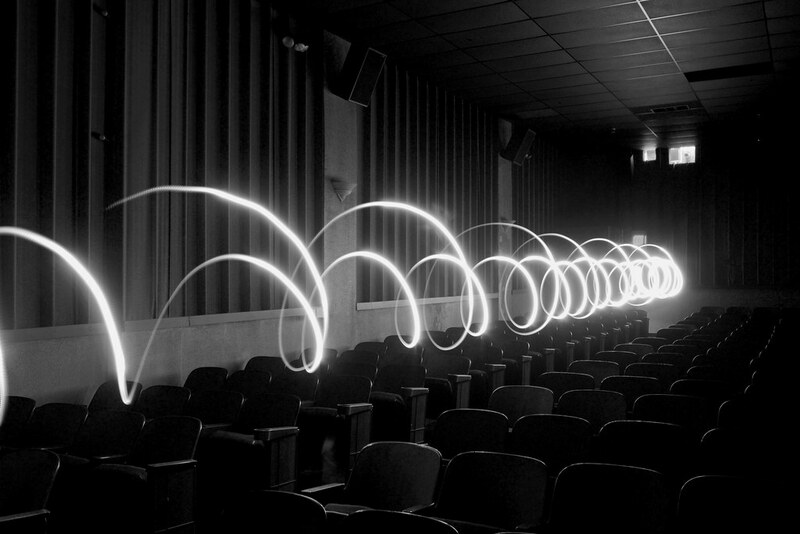 In 1930 it also became one of only three theaters in the Chicago area with special hearing devices so the deaf could enjoy the new, wildly-popular talkies. By April 1965, vaudeville had long given way to motion pictures and the theater was now under the ownership of Oscar Brotman and Leonard Sherman, among their 13 other theaters. 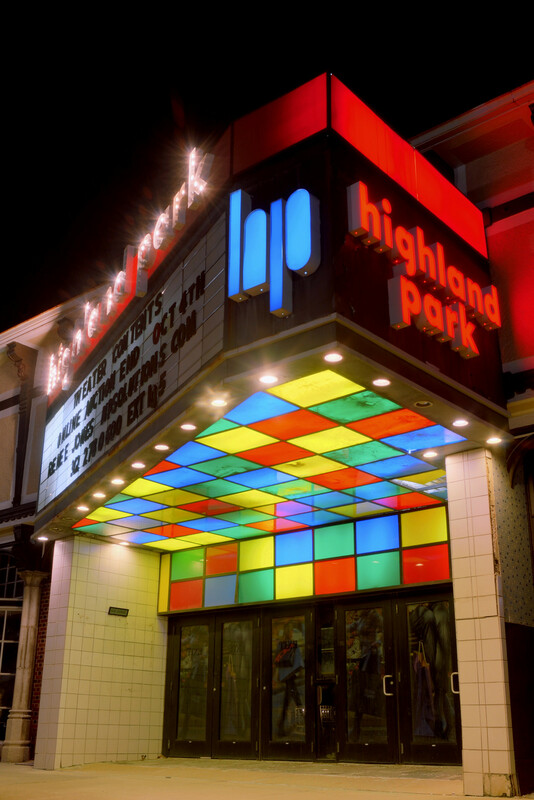 Brotman-Sherman rechristened it as the Highland Park Theater, and a dazzling new marquee with a colorful tile pattern was installed. 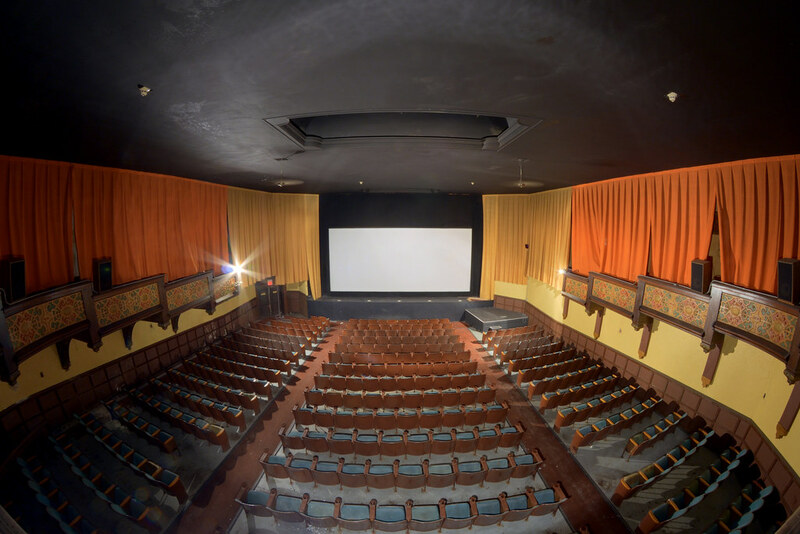 A decade later, the theater was in the hands of Fred Allen; who over time carved it into four modern cinema screens of various sizes and converted it into a second-run bargain house showing the occasional art flick. 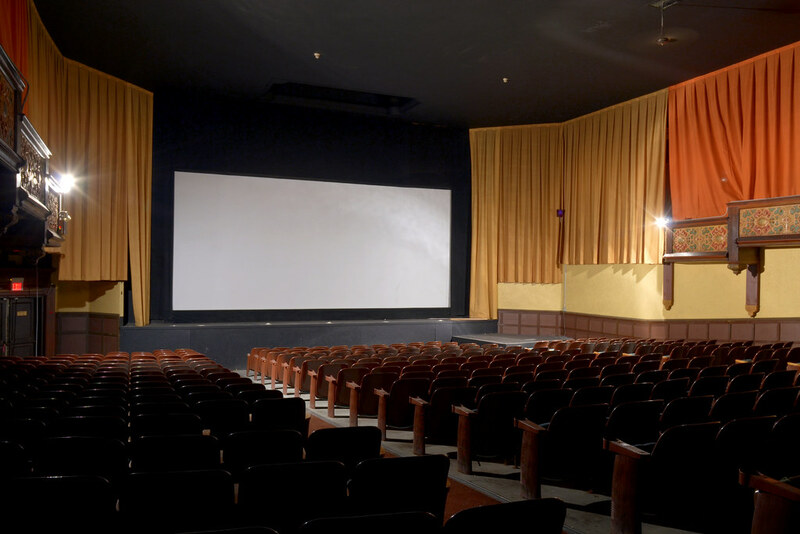 During this time, the theater developed a loyal following as new multiplexes began to dot the area – holding its ground when a modern five-screen opened a couple blocks away, in 2000. Indie and foreign films were its niche in later years, but family movies remained as regular features. 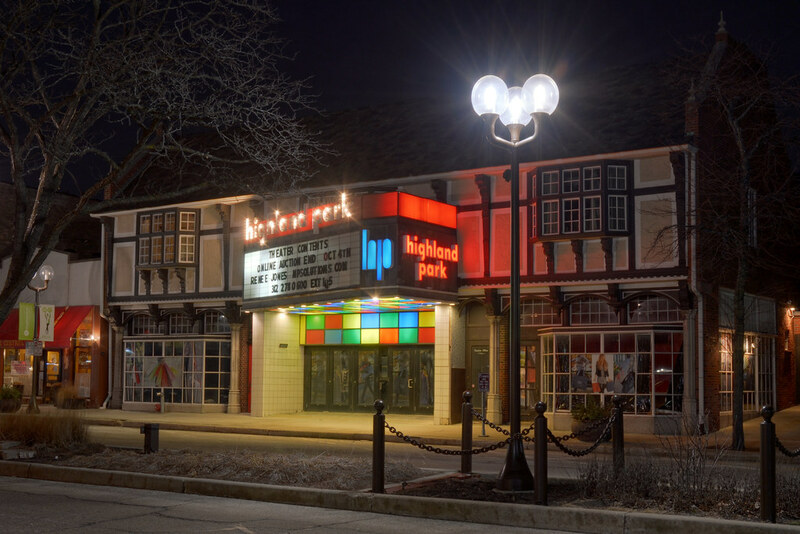 Initially appearing to see its community value, in 2009 the city of Highland Park purchased the theater for $2.1m and took over interim operations. 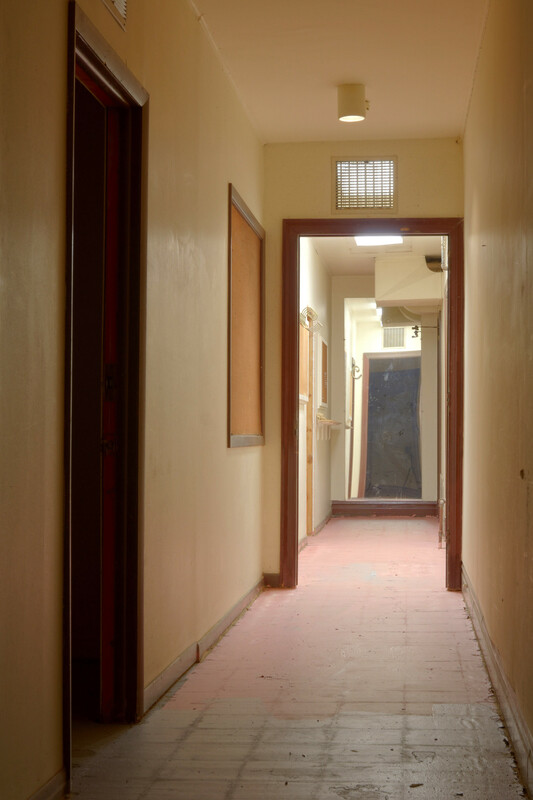 Three years later the city threw the place under the bus, and shuttered it on May 6, 2012 after failing a fire safety inspection where a grocery list of their own code violations were uncovered. “The Avengers” would be the final feature shown, here. A grassroots organization: the Alcyon Foundation, formed in an effort to save the theater and revert it back to its performing arts roots, however it failed to generate public interest or initial funding. 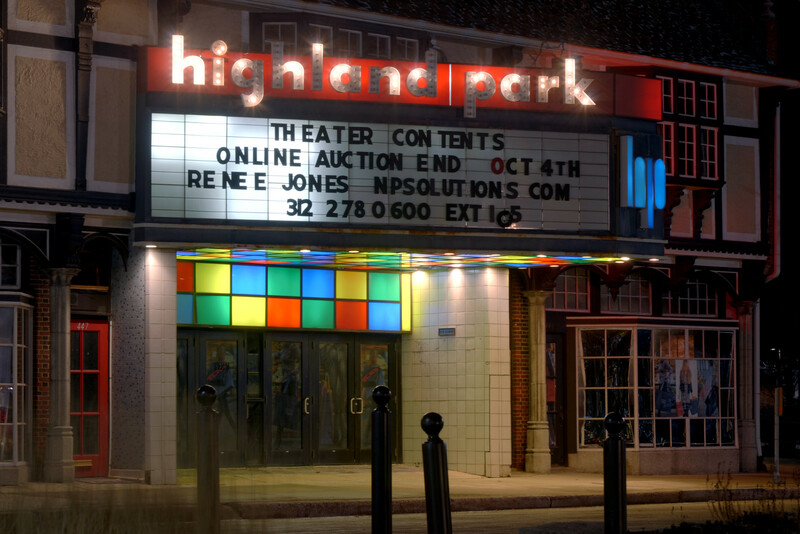 After years of further decay, Highland Park finally sold the theater to a development firm at a million-dollar loss in late-2016, and several months later: unanimously approved plans to demolish it for a new retail/restaurant and office building. 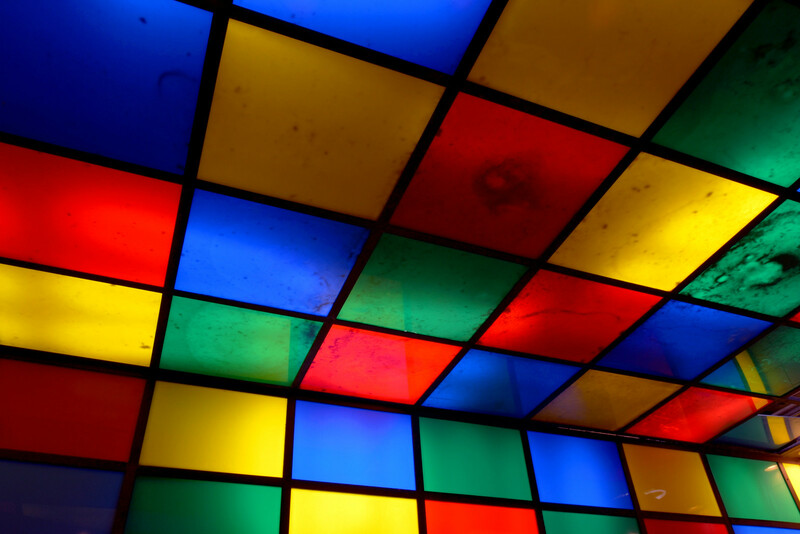 Explore: Shortly before its death warrant was signed, an online auction company was brought in to spiff the place up and sell whatever was left inside… seats, screens, projection and audio equipment, light fixtures… everything. Unfortunately it seems this either never happened or was a total bust, as nearly everything but the snack bar equipment was left behind, and the power was (mostly, seemed like it was down a phase) still on by the time we got to it – months after this auction ended. 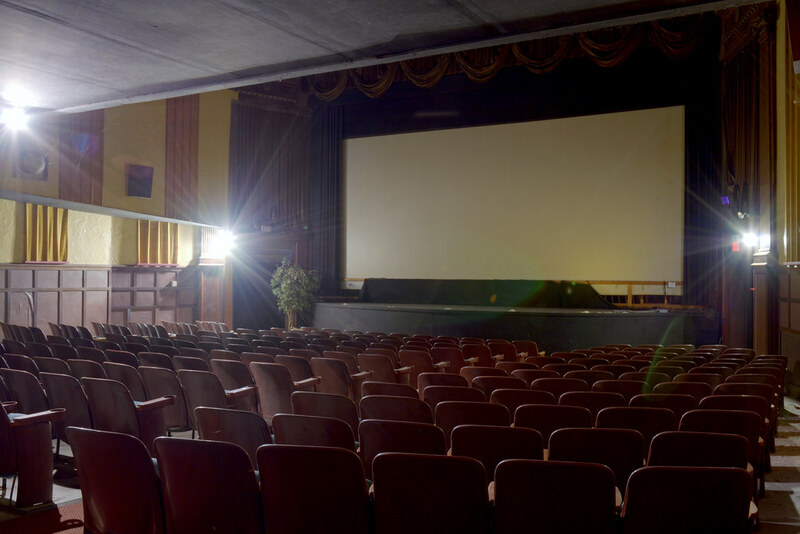 The aging, old English theme may not match the grandeur of other local theaters of this era, such as the Genesee, but hints of Tudor charm are still found throughout its lobby and concession area. 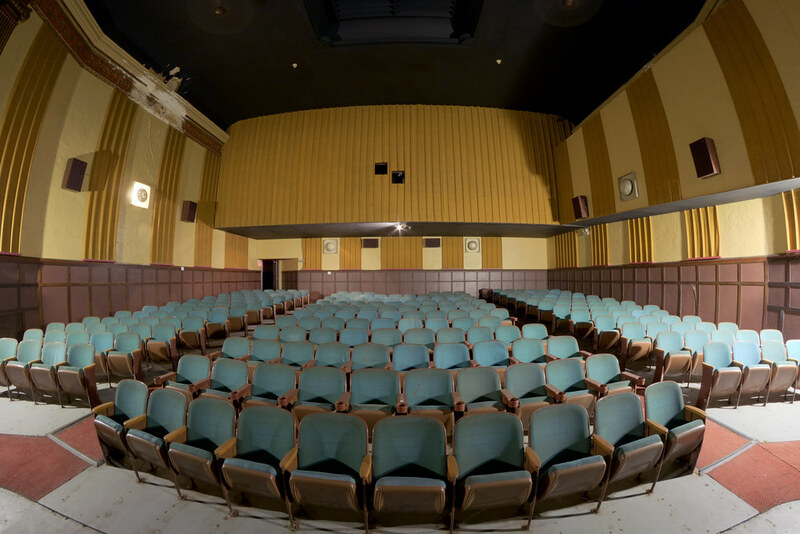 The vaudeville-era auditorium was halved into two theaters – the projection booth for theater two being directly behind theater one’s screen. 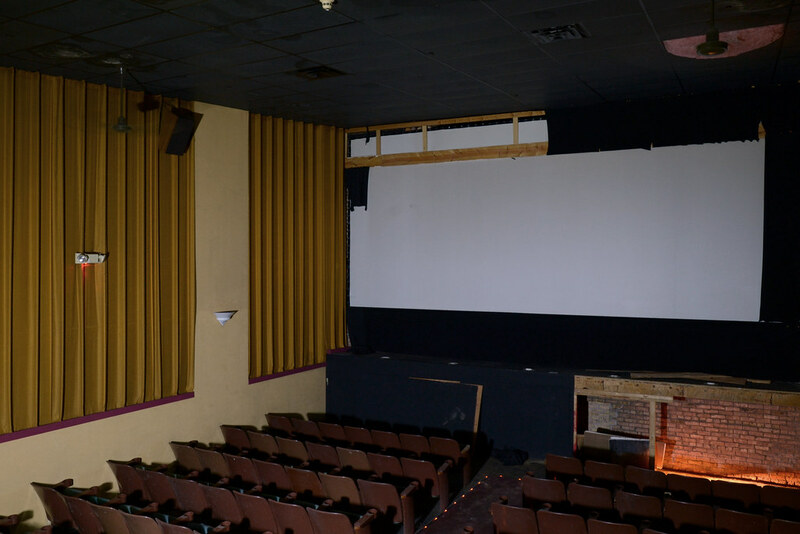 Curtains on the sides obscured the former balcony level, which lost its box seating and only served as a service corridor to three of the four projection rooms. Decorative plaster – at this point, beginning to deteriorate – lines the balcony walls. Ornate wood fittings still adorn the balcony edges and above the emergency exits. 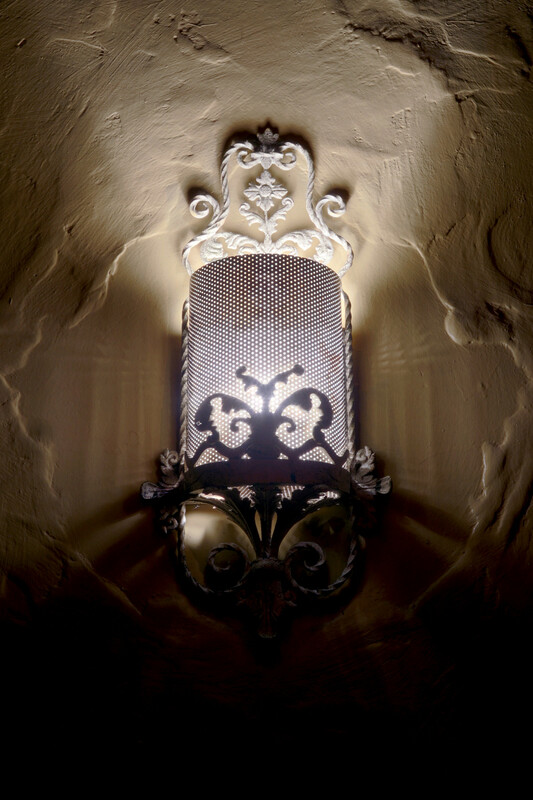 Iron wall sconces could, at one point, be found on both levels but seemed to have been already yanked from the seating area. Most of the ones on the balcony were there and still worked. 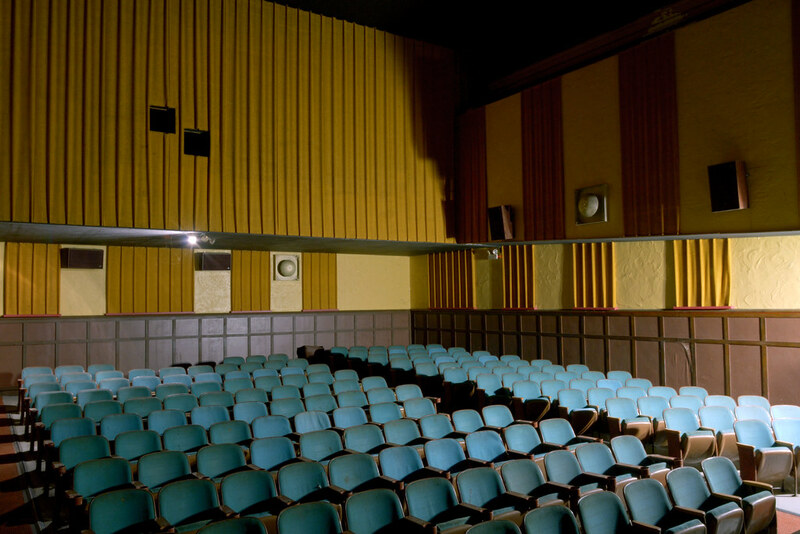 Theater two, housing the Alcyon’s original proscenium arch, is said to have inspired the set design for Sneak Previews – the televised movie review show hosted by famed Chicago movie critics, Gene Siskel and Roger Ebert. 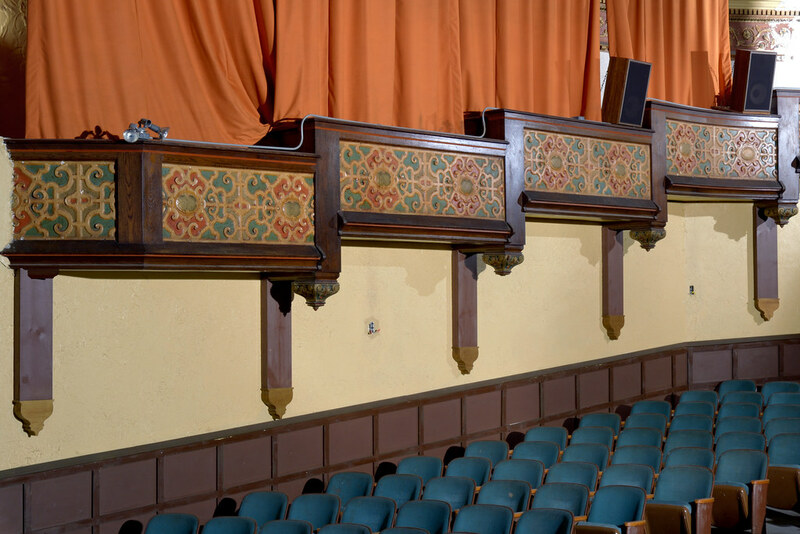 Some of the finer details of the larger theater continue into here, and the side exits feature more nice woodwork above, but the rest of the auditorium reeks of the 1970s tastes found elsewhere. The wall to the left of the stage is staggered a bit to accommodate a narrow emergency exit hallway for theater four. 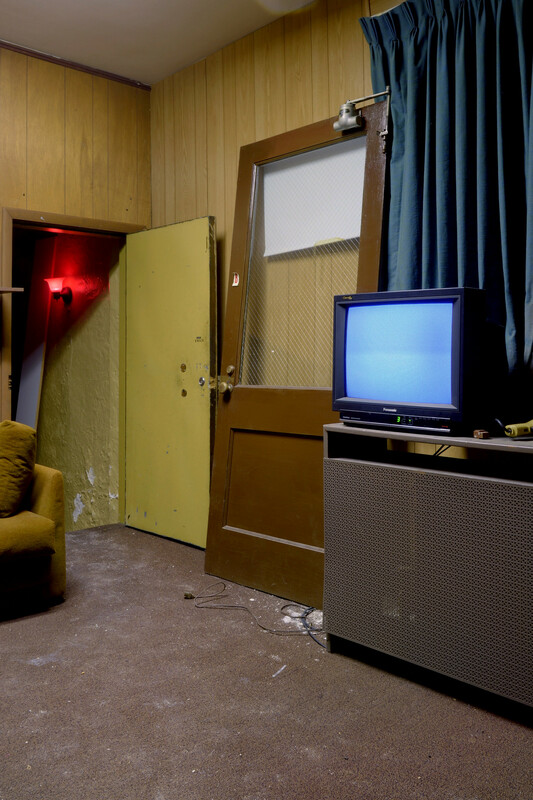 The third, smallest theater appears to have been crammed into the full width of the original backstage area. The main lights were dead in here, with only the runways and ceiling fans working. I had to light paint this one, and climb atop the entry foyer just to get everything in view. 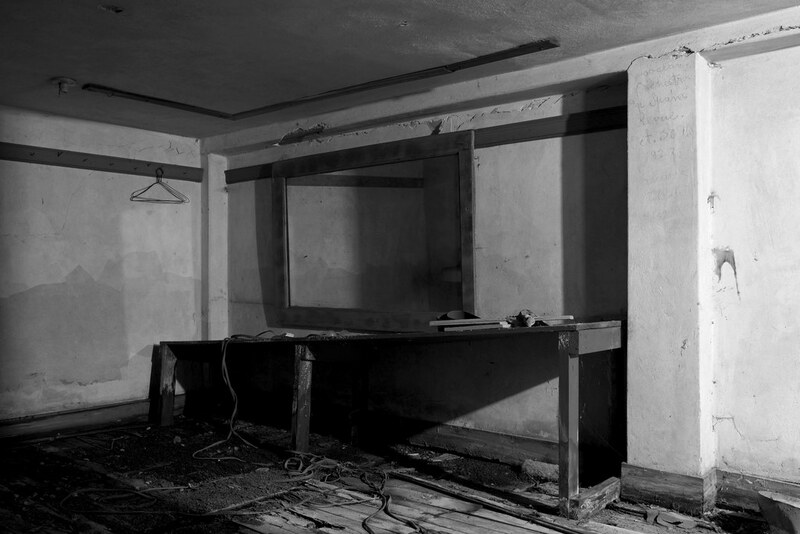 Beneath this theater screen, hidden behind a stage panel, are stairs leading to the cobweb-infested basement, which still hid a couple of vaudeville-era dressing rooms and mirrors, complete with faded graffiti from a Yugoslavian & Spanish troupe dated October 30, 1927. The Alcyon Theater and Highland Park are faintly noted. There is more but I couldn’t make the words out. 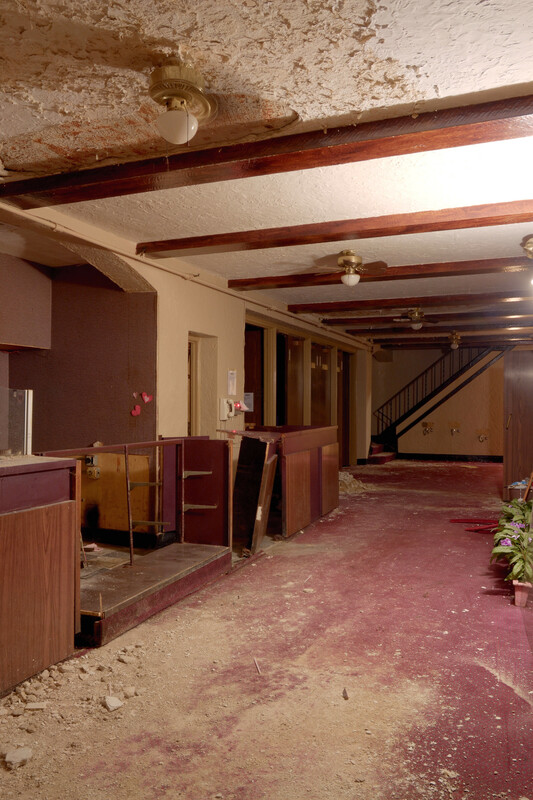 A stairway in the lobby led to the last theater: crammed onto the second floor, just left of the original auditorium. These lights also didn’t work, but there was a little more room for creative freedom, here. 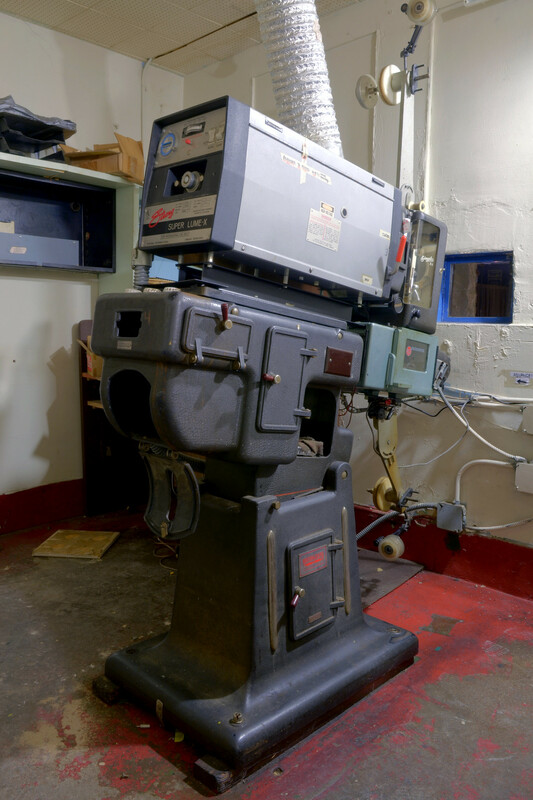 It’s worth noting that the projection room for this theater (accessible via a spiral staircase) had roof access, but no fire escape… how it ran for decades with such a glaring safety hazard is a bit flustering. I tried, but was unable to get any of these 60s-vintage, RCA Photophone projectors (or the newer Christie in theater four) to kick on. 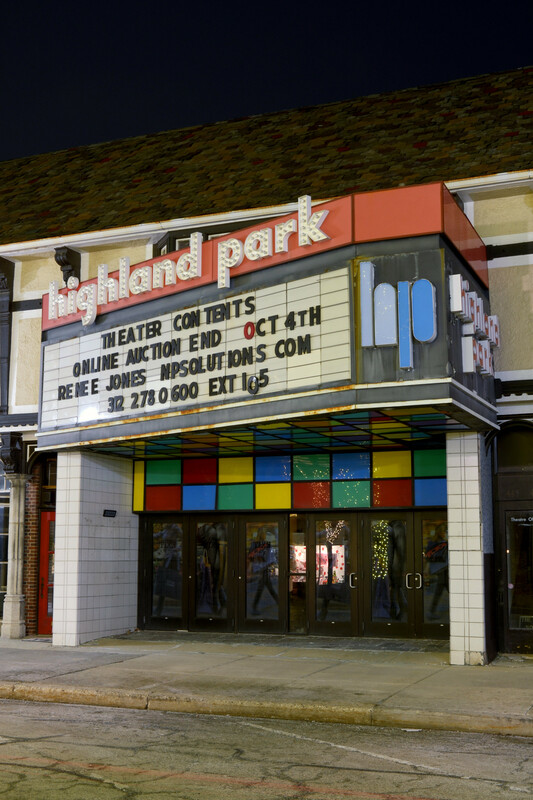 These babies were likely a deciding factor in the city losing all interest in the place, as the massive expense of digital projection was going mainstream at the time Highland Park closed. Along with the projectors: several movie trailers and random bits of equipment (lenses, reel cabinets, power rewinders, etc.) that were supposed to be auctioned off could still be found scattered about. An employee door just beyond the entrance to the theater four leads to the balcony, which in later years served only as access to the projection booths and studio/office areas above the lobby. All of which had long been cleaned out. 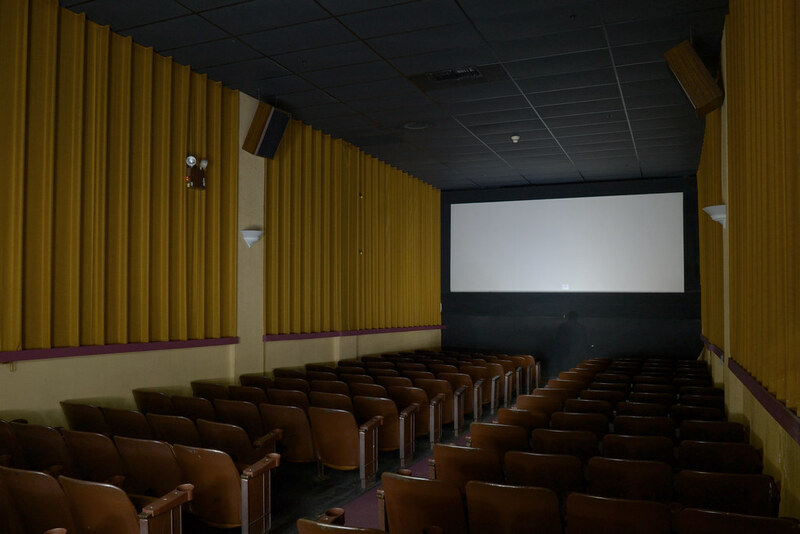 Downstairs were two additional vacant retail spaces, but they were not accessible from the theater. Now late into the night: I killed the lights, locked the place up and slid back into darkness. No alarms, no nosy locals… surprisingly no trouble at all with this one. About a month later I learned the power was finally cut, and the city was inching closer toward bringing its demise. 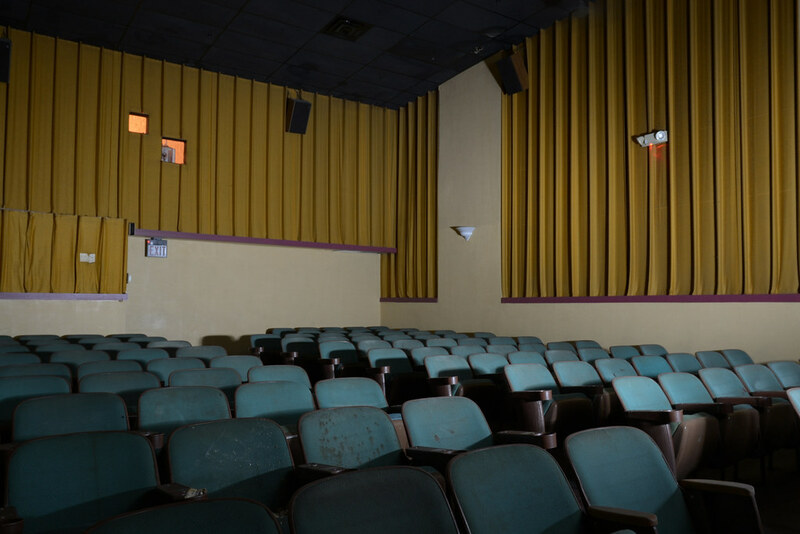 Sadly there was no effort since the failure of the Alcyon Foundation to save the Highland Park Theater, and the city finally moved to begin demolition in June 2018. They were not gentle… a sawzall was taken to the marquee to remove the “highland park” letters, and nearly everything still inside from this night is believed to have gone down with the ship. Prints from this series can be purchased through this website, or by visiting our popup gallery at ArtWauk. In your description, you make it sound like Fred Allen bought the theater in the 70s and immediately carved it up into 4 theaters. The theater was left intact with the screen at the proscenium arch of the vaudeville stage until sometime in the 90s. It had a little over 800 seats on the main level during that time. I’ve heard conflicting reports regarding how and when the configuration of the theater was changed, so in the meantime I half-intentionally left that timeline open. Guess I could reword it a bit. An April ’92 Trib article is the earliest I’ve seen that acknowledges it was at four-screens, however a former employee says the main theater was halved sometime beforehand.